I talked about Original Sin #3 on our last episode but wanted to keep up on writing. So sit back and be ready for a roller coaster ending that I'm still trying to wrap my head around. The Orb is custody and being held at Avengers Tower. Midas, his daughter and all of those mindless ones have disappeared and the Avengers are unable to track them. The Orb is being interrogated by Wolverine and Hulk. The orb confesses to taking the Watcher's eye but that he is just as interested in finding out whom actually committed the murder as they are. The team of Emma Frost, Ant-Man and Black Panther have found dozens of monstrous corpses in subterra along with a bag full of the green gamma irradiated bullets. Black Panther also come to the conclusion that Watcher was killed by somebody who didn't want him knowing this person's secrets and knew who the killer was. Punisher and Dr. Strange study the corpse they found and determine that whomever are committing these murders has to be highly trained elite marksman, a group of people that the Punisher says make up a very small list. We go to deep space where Gamora, Moon Knight and Winter Soldier are conducting their investigation. they find a trail of shell casings that lead to a planet where they find not only no bodies of victims, but no sign that life had ever existed there. Moon Knight sends a camera drone into orbit and they discover that planet was the victim, it was was alive, similar to Ego the Living Planet. We go to a scene where the above group is speaking to the "mysterious boss" and even though he is shadowed, it looks like Nick Fury to me. The mysterious boss has somebody else in the room with him who is also in shadows. The boss tells this person to expect visitors and that they will need a lot more of these...."these" being the glowing green gamma irradiated bullets. Who is the mysterious boss? We go back to Avengers Tower where Hulk and Wolverine are softening up the Orb to be questioned by Nick Fury. After we see Nick talking with Captain America, we see Nick holding the Watcher's eye asking himself, why didn't he see any secrets when everyone else did. Next to the Watcher, Nick Fury is second in line for the master of secrets, so yes, why was Nick Fury unaffected by all those secrets being released? 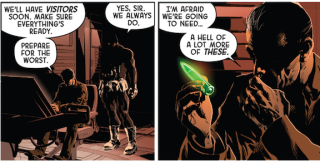 We then go back to deep space where Moon Knight, Gamora and Winter Soldier are going over their findings. 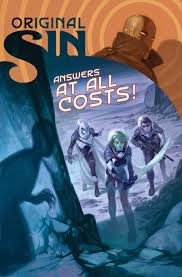 Gamora and Moon Knight ask Winter Soldier a question, and find that he is nowhere to be see. They head back to ship thinking he be in there, but as they approach the ship explodes abandoning the two of them there and they come to the conclusion that not only is Bucky involved in the killings but that he is now the prime suspect. We return to Avengers Tower where Nick is asking who has the Watchers other eye when Bucky teleports in behind him. Nick starts to ask where Bucky came from when he pulls out a gun and blasts Nick in the chest. 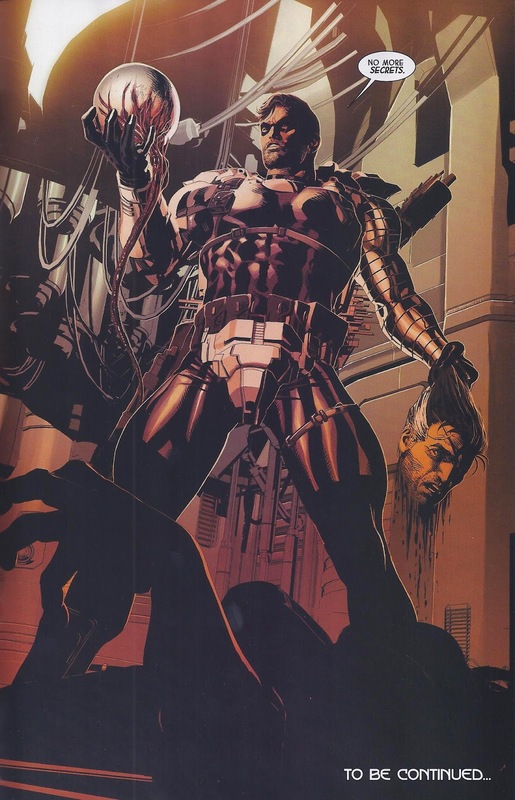 Bucky tells Nick there is no more running form their sins and no more turning a blind eye, he pulls out a sword or machete and hacks off Nick's head. The last page we see Bucky the Winter Soldier holding the Watcher's eye in one hand and Nick's head in the other saying, No more secrets. So like a good mystery should make you ask, WHAT THE HELL IS GOING ON?! Well done Jason Aaron, well done.